Ice Maps, Orbitals, and more Make their Debut in Ashes v.70! Further increasing the strategic depth and scale of the game. v.70 adds Ice Maps, Orbitals, New "Cruiser Factory" building, and more! 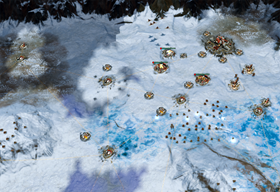 Progress for Ashes of the Singularity is moving along nicely and the Dev Team is pleased to present you with their latest update, v.70! This update includes a lot of exciting new features and bug fixes. For a full and detailed change log, check the bottom of the post. Incursion: Take your enemy by surprise and drop a small raiding force behind their lines for an attack they won't see until it's shooting them right in the face. Plasma Storm: Your enemy will get a real "charge" out of this one! This orbital strike affects an area of your choice and damages all enemy units and buildings over time within that area. Intensive Care: Is there a doctor in the house? Well, there is now! 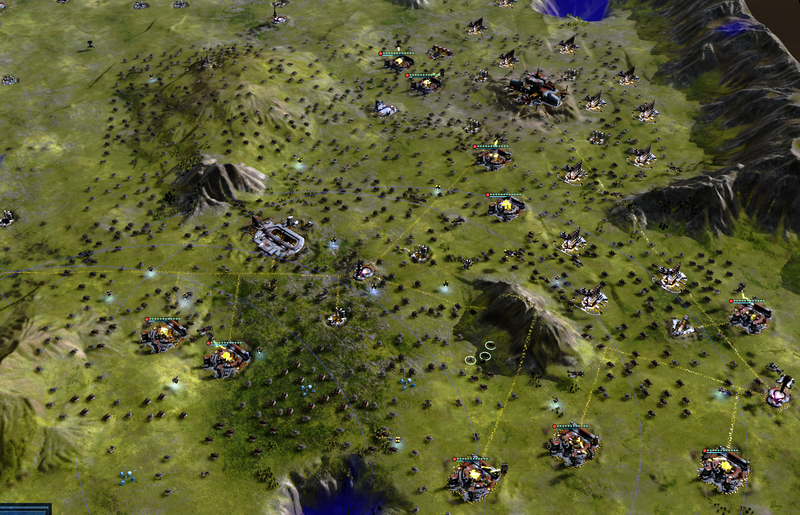 Heal friendly units and buildings within an affected area with this orbital. Call Engineer: Engineers too slow and never around when you REALLY need them? 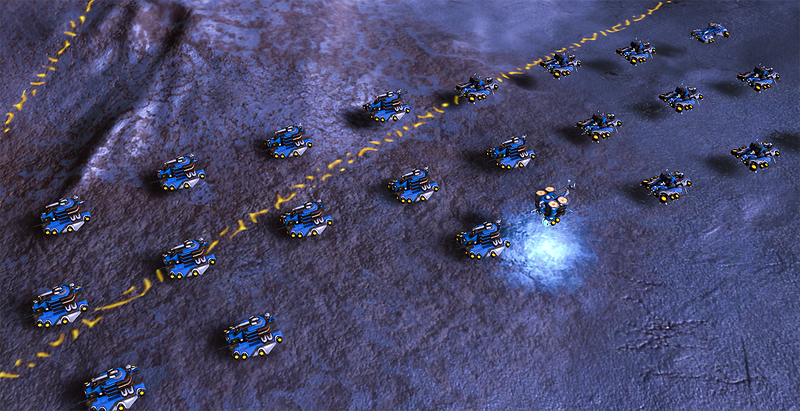 Now you can deliver an engineer to a selected spot on the map and have them begin work immediately, without all of that pesky down time. Winter is coming...and so are the Ice Maps! The team has added four new maps to the game: Shredded, Crater, Triad, and Frosthaven. As a bonus, Scorpio, Cerius, Aven and Frosthaven maps now also have night environments! Check out these screen shots - we think they're pretty...cool. Is your early game stuck on "cruise" control? Not anymore! Cruiser units now have their own dedicated factory required for construction. This allows for more variety and interest in early-game decisions as you start to construct your base and raise your army. There are some more changes, additions, and bug fixes in v.70 which you can read about in detail below. We hope you enjoy the new features! Don't draw shadows for MB frames, Re-use Initial frame data for MB frames for detail objects. RegionRenderer. Now takes color directly in 32bit format. Way less temporary memory, and memory movement. Restricting UI scale by resolution to make sure a minimum UI area is visible in the current resolution. Made it so that brand new games with no existing settings default to a resolution that matches the desktop, and fixed the options screen not reflecting that. Much improved performance on both DX11 and DX12! quick question..haven't tried the update yet but for the plasma storm..its an area ability..if i chose to initiate it during battle..would that storm affect me too? or would i be immune ? I really think we should bring up the subject of intel which is entirely nonexistant in this game. the red blurs just aren't going to cut it. they give much less info than even WW II radar did and they give this incredibly insufficient and frustrating gameplay experience. you can't target it follow it retreat from it or do anything at all with it. it's utterly frustrating. 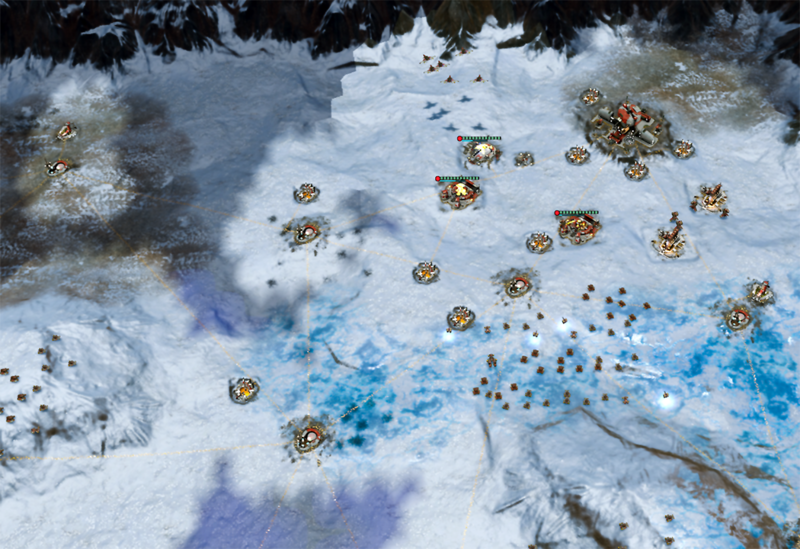 plus no matter how much radar range you have apart from your own units the map is filled with big fat nothing that this red doesn't do anything to help fill. I want to be able to interact with my intel so that the game gain strategic depth and so that intel regain some importance. I want these blurs to be more detailed and informative. I want to know what size and how many. air or not air. All that. how could thousands of years into the future have had such a toll on technology and fun? This new update brings some very nice improvements and new features. Performances make a good step forward, graphics and visual effects are shaping nicely, the strategic map is great, and formations seem more reactive and more organized. this is very nice as we often want, at this quite early stage and with each new update, to analyze and build some nice gameplay based on the behaviours of the groups and their complementarity. even if the game is macro oriented for sure, i'm pretty certain and very pleased to think that some micro with the groups compositions, movements and placements can bring different and very interesting effects with time and training. More of that, splitting the frigates and cruisers factory, seeing the new orbitals and the tactical possibilities they allow, given the questions you asked and the topics you started about the different build orders, stratégies and such are valuable clues about your will to develop a deep combat part. Great. For sure, we are still far from the finish line and many aspects are to be improved. The radar, the ranges of engagement, the patfinding, and maybe some attention about the orbital abilities. they seem to cost the price, but what about something to prevent obvious spams : cooldowns, or something else? But for now, i'm very pleased to see that the game mechanics are getting more and more squared and deep. The fine balance discussions will come once all the races, units and abilities will be implemented. If nothing new is to come before next year, i wish you a merry Christmas and a happy end of the year. Sorry. This part of the game isn't subject to change. I recommend SUpCom:FAF for you. Thanks and I agree with your assessment. We still have a long way to go to add more sufficient strategic depth imo (and I'm the designer). The big one, for me, is the investing in economic power versus military power. Rigbht now, military power = economic power which is simplistic. We took a baby step with the amplifier. But it's not enough. Your statement is indeed very interesting design-wise. On one hand, having a direct connection between the economic and military systems, with some simple ways to improve it, such as amplifiers allowing a better income, are nice and readable enough for the major part of the players. Then we can, in a second step, invest in buildings and general upgrades like HP upgrades or Firepower upgrades. Lv1, lv2...etc. 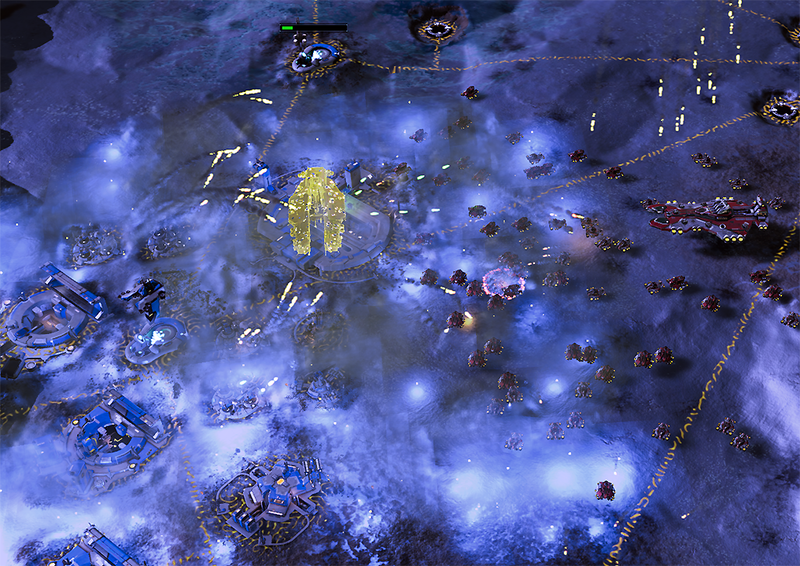 This kind of system allows quite a "fast" paced tech course so the player can focus almost entirely on the battlefield. This is not a bad thing. On the other hand, having a real tech tree and maybe the kind of buildings we had in Sins of a solar empire, Civilian research centers and Military research centers, able to "unlock" the different tiers and upgrades in the tech tree (or directly in the buildings) regarding the number of these buildings, could also have a great value. So as you said separate and bring some more depth in the economic and military tech courses. such possibilities, implemented with a great readability of the tech tree and multiple build choices could be awesome. The relevant question here, from my point of view, is to know if you want a simple and ergonomic macro economy to focus on the combat part, or more in-depth mechanics for the eco and military courses of the game. Maybe including a kind of "limit" in the number of research buildings we can have, through a "slot" system like Sins. it will inevitably bring the question of the pace of the games and the tricky time ratio between base/tech management and combat...but, if perfectly done, readable and ergonomic, it could undoubtedly add a great value to AotS imo. I'm doing the Mr. Mom thing tonight so no games so far. But I thought I'd run the benchmarks. My hardware: X58 motherboard, 12GB RAM, i7-920 OC'd@3.6Ghz, GTX 980SC, Win10/64. I would definitely say, as the benchmarks see it, there were some very good improvements! Well done to the dev team! However, I had some stability issues. I have had absolutely NONE since I first downloaded and started the game in version 0.63. Of course, that was Win7/64 and I only converted to Win10/64 this week. Regardless, the first time I tried to load the new version, having clicked on "Play" in the Steam Library list, the load hung. At least it took MUCH longer than I'd every seen it take. I used Task Manager to kill it, reloaded, and all was fine. I then ran the Full benchmark with no issues. However, at the end of the first time I ran the CPU benchmark the game just disappeared - crashed with no messages or information on my desktop. I just re-started it from the Steam Library, re-ran it, and all was well. I wish I had some info as to the latter. But the performance has definitely ticked up! Looking forward to trying out actual gameplay changes when I get a chance! how could thousands of years into the future have had such a toll on technology and fun? Its like now in our time, we have more advanced radars and tech but, at the same time we build phantom planes that the radars cannot see. that's your answer. Lol. Tatsu being Tatsu again. Personally, I enjoy the radar system. It's not as informative as SupCom's, but it makes sense that you shouldn't worry about individual units in a fight spanning hundreds. The power amplifier is a great step towards improving the economic buildup of Ashes. And now we have orbital abilities. (INCURSION OP). What's the role of orbital abilities right now? I mean, engineer calldowns are super useful, but plasma storm and Incursion just seem like I WIN buttons with Quanta price tags. One well-placed scout plane and the enemy could be reeling from an attack they either missed or couldn't see coming. That's very frustrating in a game of this genre. In addition, Ashes has no artillery counterplay. In SupCom, for example, shields were used to protect PD from units, and artillery was used to crack those shields. For Tac missiles you had TMD, and for Nukes you had Anti nukes. Are orbital abilities going to provide some of that destructive power without the necessary counters? The orbital strike especially sounds OP against Seeds in the late game, without any real counter besides excessive air spam. Also, INCURSION OP. I built the orbital calldown structure for that almost immediately at the start and got this amazing stack of t1/t2 units at the three minute mark. Suddenly I could expand super quickly and outpace the Tough AI without any issues. Using it late game was also insane, as I could gut the enemy's resource deposits with little to no investment. Suggestion to make it less OP: Make it scale based on your army rating or # of research structures (orbital calldowns/quantum relays). Early game it will become less of a must-have, and late game it will be more useful to call down a small T1 army with lots of T2 mixed in. What makes me a bit step back on this game, is that too many new rts payers give the rong ideas and seems no one understant the problems this game have. Tatsu cant be more right ,he like me are ust to complex Rts games. This is the time we showld say what we know, and thats what he is doing. The intel right now just dont exist. Sry but i see too many times in many games no one cares what experience players say. From my humble experience, anyone's opinion is good to take for the devs, and "experienced" players don't always possess the truth. i mean, plenty of people here certainly play RTS games since years, if not decades, and don't feel the need to qualify themselves as "experienced" or "competitive" players to voice a subjective opinion, hoping to influence the dev teams. With all due respect, i unfortunately have seen more than one beta test sinking into this kind of discussions, slippery for the devs, and more than one game ending as a boring "rushers nest" or "turtlers nest", because pseudo "true gamers" wanted so. Stardock and Oxide games certainly already have a precise vision of what they want for their game, and i hope they'll stick to it and avoid these kind of traps with their beta phase. But we can always put some objective and reasonable arguments. Indeed, the radar system seems to show some current limits : For example, when we select the building or unit, there is no clear "detection range", so to say a clear circle indicating the maximum detection range when we hold the Alt button. such an indication could be useful to place our units or construct the radar building efficiently. Indeed, the radar system provides limited informations. 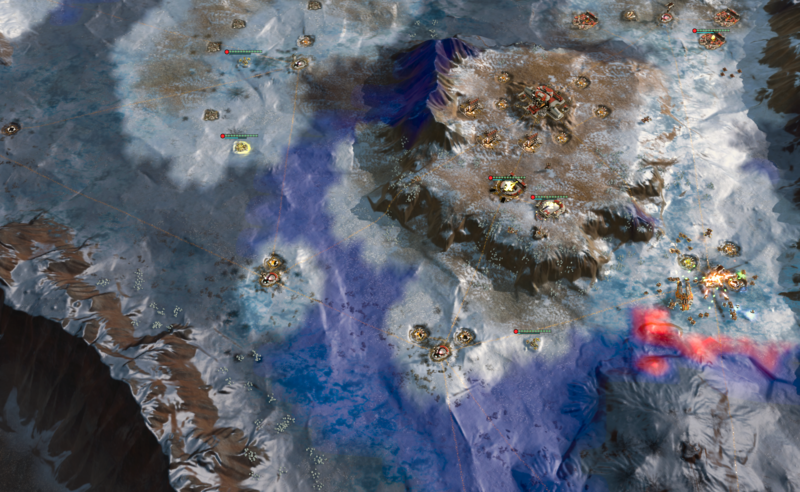 Its "Line of Sight" is obstructed by topography, the range is not always very clear for now and the intel gathered, currently represented by the "red zones" are just indicating an enemy presence. For example, they don't provide the kind of intel we have in Forged alliance, with the allmighty radars, and they don't provide as well the kind of informations we have in starcraft 2 with the detection tower. we don't have the number of enemies, we don't have their precise position, the red zone is quite thin..etc. Indeed, maybe the corresponding visual effects could benefit from a bit of work. But, is it really a terrible thing that the game provides us with a limited radar building and detection for units to advantage other kind of recon actions? we can deploy Hermes as a ground scout unit, Pan as a scout air unit (it has a good detection/vision range)...is it so terrible that the player has to gather himself the intel? we can deploy scouts on the map, we can build our groups with scout units to gain a bit of detection range, we can send Pans, protected with some Furys, as tiny recon groups to gather a fast intel on farther zones...and finally we have some triggered abilities : Sensor Sweep for the PHC, we'll have the Sensor Drone for the Substrate...to conclude, this is always a very early stage, all the routines, units or abilities are not implemented yet, or are subject to change. No offense of course, but don't you prefer, as an experienced player, gaining an advantage over your opponent with active actions and having to micro some recon maneuvers? People who think that those that don't agree with them are just less experienced and have yet to be "enlightened" by that experience. Whatever that means. We all enjoy games differently, and the devs are looking for all of our feedback equally (more or less). Give feedback, don't throw vague insults. i didn't think he threw a vague insult ..first comment was about having more Intel.... whats so wrong with that? and i dont think engineer is putting down ideas of people who are not rts experienced players.. there is casual players who knows about strategy..then players who go the extra mile..play mostly rts so they see how different games and flaws...and the devs have already stated they want input from rts veterans.. their words not the engineers or anyone else.. so when someone comes a long offering that type of input...and it gets shut down by saying go play this...well i personally don't think its right but oh well. For me a compromise would be nice. A while back ASADDF did a nice mock up of a full screen mini-map where T3 were represented by a large dot, T2 medium and T1 small. If this method were used in the radar I think it would work well. The player would have a rough idea what is coming which aids in his strategic thought processes but the system also retains the value of sending a Pan etc. if they player wants to. It lets the player decide how micro they want to go without too much punishment or bonus either way. Later a unit could even be added to add the fogginess back with-in a radius around it, like a half way step between full radar coverage and full radar block. actually that's an obsolete tech. they will be detected nowadays. that's the wrong road to take this. for more "weaknesses" regarding radar you'll have to look to the past. but really there's no such thing as a radar that can't give you exact velocity, size and that can't tell between air and land. A well positioned plasma storm or well targeted incursion should be able to make a huge difference. The only issue presently is how hard it is to prevent it. In the beta there will be a new building called the Orbital nullifier. IT prevents any opponent form using any global ability within that area. I never have issues keeping an eye on what my opponents are doing. I build Pans and I use scans. The sensor towers are there to tell you where there are concentrations of enemies. They work as designed and we really like how they're working. In lieu of an Observer mode, Frogboy, it would be awesome to have some of the dev team (or, especially, you) make a start-to-finish gameplay with play-by-play voiceover or something of the ilk!